This post contains affiliate links. Also, sizing in collage above is not intended to be an accurate representation of size. Just like your wardrobe needs refreshed for spring, so does your house! It doesn’t have to be a complete overhaul–it can be as easy as swapping out throw pillows and curtains or as involved as swapping out rugs, end tables, etc. You want to go for a fresh look with light and airy pieces. Target is having an amazing home sale that ends today, so I selected some of my favorite pieces to share with you. Everything shown above and listed below is currently on sale! Plus, take $20 off $100 purchase of furniture and/or rugs with code SPRING. White curtains (currently 30% off–$15.39 per panel): I am a huge fan of light and airy curtains. White curtains look so fresh and brighten up any room. Avoid heavier fabrics, and make sure to get at least a 95″ panel so you can place the curtain rod close to the ceiling to make the room look bigger. These are in my cart right now! 5 x 7′ blush rug (currently 5% off–$123.49 + eligible for the additional savings): blush is just so pretty. It adds color to a room without overwhelming it. This would be pretty with a white, cream, or even gray couch. Circle mirror (currently 30% off–$42): circle mirrors are HUGE right now! This is a chic update, especially if you have an area on a wall to fill. Hang it on a smaller wall by itself, or hang it over a console table for a more pulled-together look! White ceramic table lamp (currently 30% off–$27.99): I’m so funny when it comes to lamps! 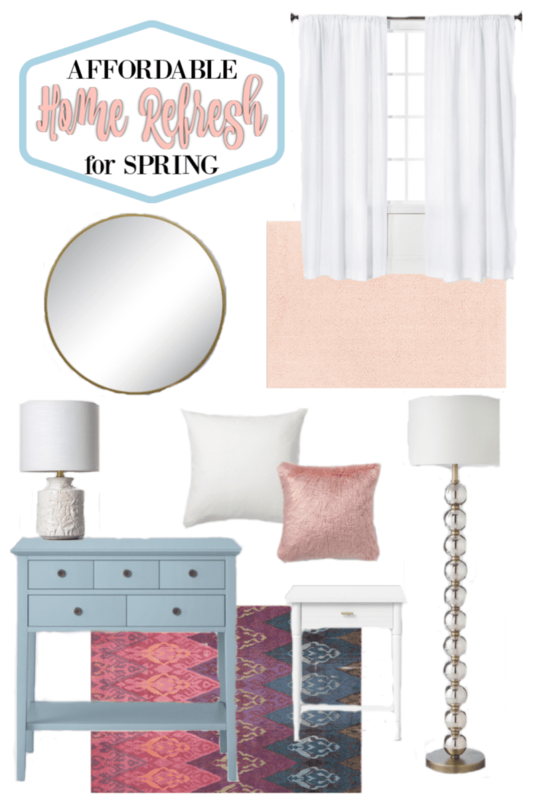 I like to keep it fairly neutral, but I also want something pretty. This meets both of those requirements, and the carved base adds character. Light blue/aqua console table (currently 30% off–$97.49 + eligible for the additional savings): I have a similar console table and love it! Every room should have one conversation piece. This little table packs a punch because of it’s color, and is a fun update. Oversized white textured throw pillows (currently 30% off–$20.99): I got two of these throw pillows in the EURO size for my new charcoal couch, and paired it with the smaller size of the blush fur pillow. Regardless of what your decor is, oversized white pillows will freshen up as they fit with any color scheme (especially if you add white curtains to the room!). Blush fur throw pillows (currently 30% off–$13.99 for the small size): OK, I love these, but get the smaller size because the bigger ones are overwhelming! If you love the pillows but hate the blush color, they also come in white and a light tan! White end table with gold pull (currently 30% off–$62.99 + eligible for the additional savings): y’all, I have had my eye on this little end table since it made it’s debut, and I bought not just one but TWO of them last night!!!! What’s so funny is my friend Emily of Gathered Living is an interior designer and she come over to help layout a floor plan for the living room re-do we’re doing. And as soon as I described these end tables, she knew exactly what I was talking about because she loves them too! PS–if you live in the central Kentucky area, you can hire Emily to help you design your space! She will do anything from a floor plan to actually picking out the pieces and installing everything for you. Glass metal stacked floor lamp with cream shade (currently 30% off–$55.99): I hate boring floor lamps. This one is very neutral, but is still visually appealing and at a great price! 8 x 10′ bright colors geometric area rug (currently 20% off–$359.99 + eligible for the additional savings): the actual measurements are 7’10” x 9’10”. This rug is also a great conversation piece for a room. If you have white or cream furniture in your living room, this rug is a great piece to add. It’s visually interesting and really adds a flair to the room.